It was twilight, and my little son and I stood at the water’s edge. He was so excited to get to the swimming area of the park, but excitement turned to trepidation when he realized this was a lake, and not a pool. It had inhabitants. He could hear the occasional splash as a fish breached the water’s surface and made a jump. His older brother had filled his head with stories of unknown horrors, straight out of Twilight Zone episodes and brotherly teasing, of what kind of dangers could be lurking in there, and now he couldn’t let it go. On and on this went. I wondered how this child came to be mine, so full of fears, while I was always the brave one. I thought about my more daring years, when I would go out to lakes late at night with boyfriends, skinny dipping with who knows what swimming around us, and I marveled that I was brave enough to cast all concerns aside and be completely vulnerable to the creatures of the murky lake. I wasn’t scared now, but I did like the relative safety of a clothing barrier. But maybe a boy like that needs a mother like me, as I finally coaxed him out to the middle of the swimming area, sitting on our bottoms on soft mud, reveling at the sounds of the night. We became a part of nature, he and I, experiencing it from the inside. It was just a short time, and then he was done, which was fine by me, and we climbed out as wet sand fell off our rears. We got on our bikes and rode back to our cabin, excited to see what tomorrow would bring. 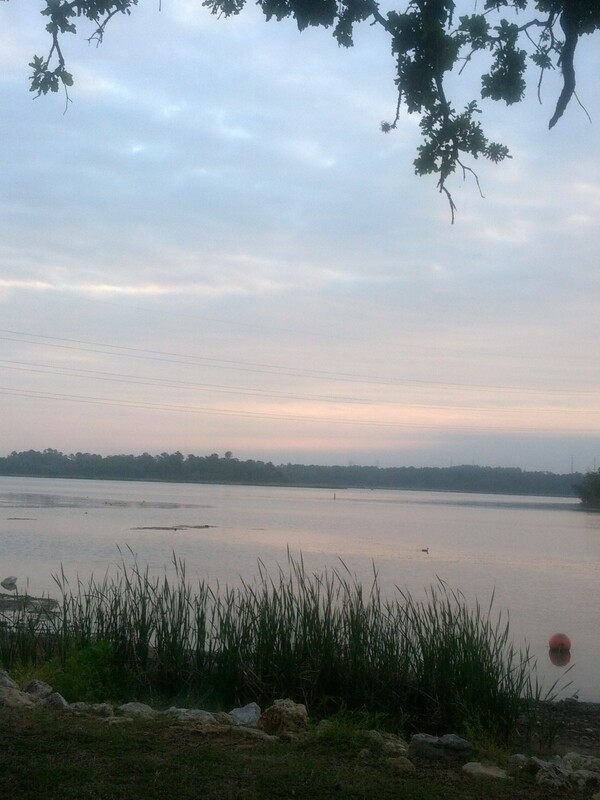 Dawn breaks at South Shore Park, on the shores of Lake Bastrop, and the birds begin calling. 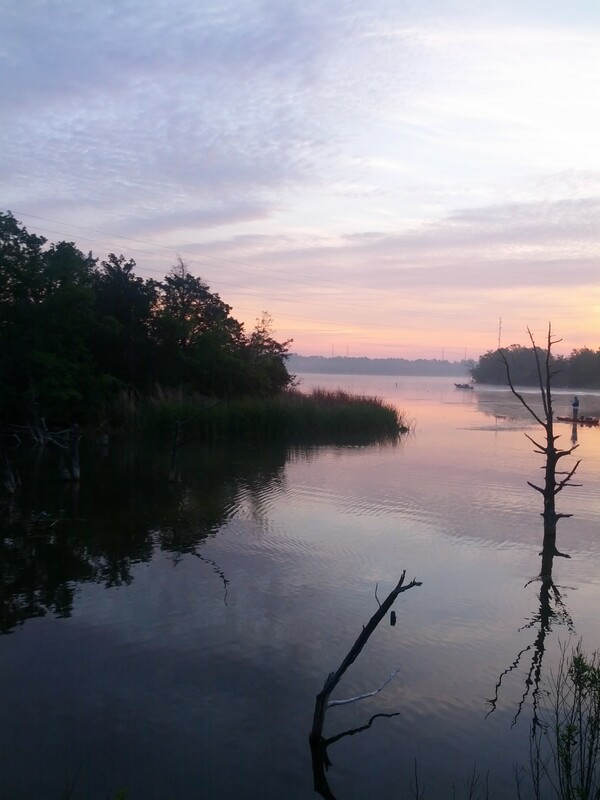 Now is the time to set the fishing poles out, as the fish are jumping in the nearby cove, but the park is sleepy yet. 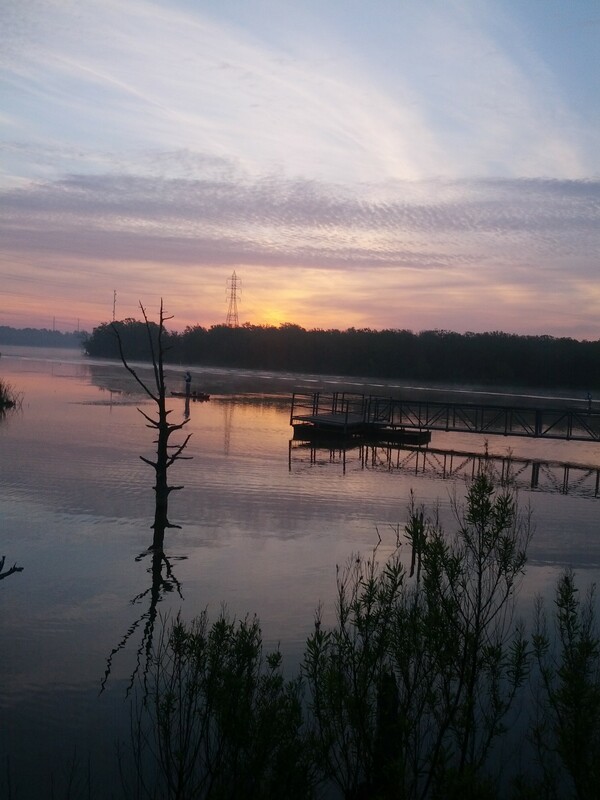 I was wearing my bright blue flannel pajamas, not bothering to dress yet before biking off to the bathroom and then the bench, sitting quietly with J as we enjoy the sunrise together. We eased back into camp, and after I dressed, he made breakfast on our cook stove at the picnic table outside our cabin. Children reluctantly stretched and got out of bed, shaking sleep from their eyes to come sit to eat. Of course, the first thing the little one wanted to do was try swimming again. We were the only ones creeping into the swimming area at seven in the morning. A mist lifted off the water, and we shivered in the adjustments to the coolness; first the ankles, then the knees, then the waist. We watched the first wave of canoes and kayaks start to make their way across the water, dropping fishing lines in the lake that is stocked regularly with Florida largemouth bass and three kinds of catfish, as well as crappie and perch. We abandon swimming for biking. We had loaded up all four bikes. The night before, we had biked around the park, exploring the fishing pier and boat dock, but then we had approached the road and I decided its deep darkness was probably not that safe to explore at that particular time. I had promised we would go back down the road during the daytime; plus, we needed to anyways, seeing as how we arrived too late for official check in the evening before. The camp office was down that way. 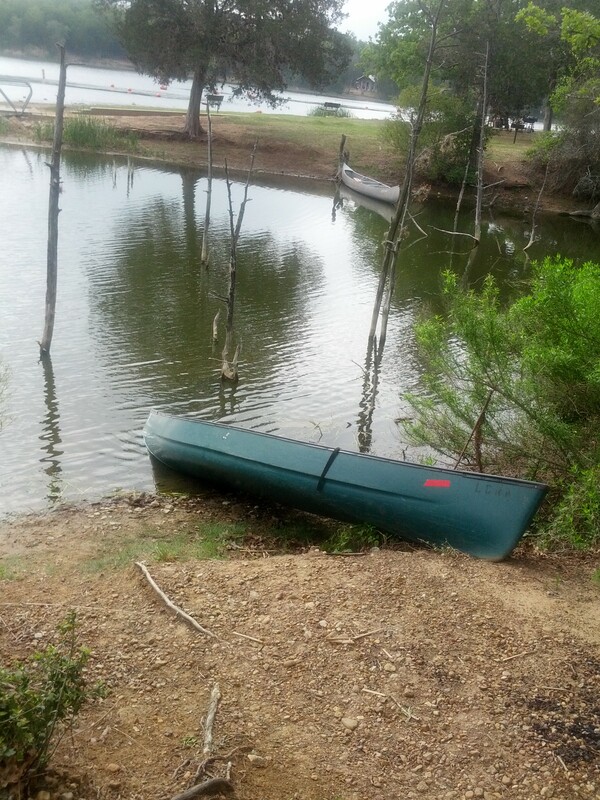 When we checked in, a lady was renting all the available canoes and kayaks for an outdoors club that was meeting today. We considered the $5 rental for another time, but today settled on adding a cane fishing pole to our account as we settled our day fees and got our sticker. We each took turns attempting to catch fish with the cane pole, a bit of Spam on the end for bait, but it never really panned out. My older son was doubtful we could even catch something with that primitive pole, but I knew it was not the pole, but the timing of our fishing that was off that day. I still had a good time holding the pole in the warm sunshine, occasionally taking a sip from the little bottle of wine in my pocket, writing in my journal, and watching the birds. The birds of the lake were mostly ordinary lake birds this weekend: dozens of American Coots, a lone Great Egret across the lake, a Great Blue Heron here and there. Small flocks of snowy egrets crossed the sky. I wanted to see the Osprey that our particular area of cabins got its name from (Osprey Point), but it did not show itself until much later in the day, delighting me as it flew directly above me, looking for a fishy lunch. The most unusual bird of the day, and a new one for the year for me (#84), was a very small Green Heron who was almost blending in with the shoreline, slowly making his way around the reeds. On a biking venture around the Fisherman’s Loop Trail, I got a glimpse of a yellow throated warbler, also new for the year (#85). 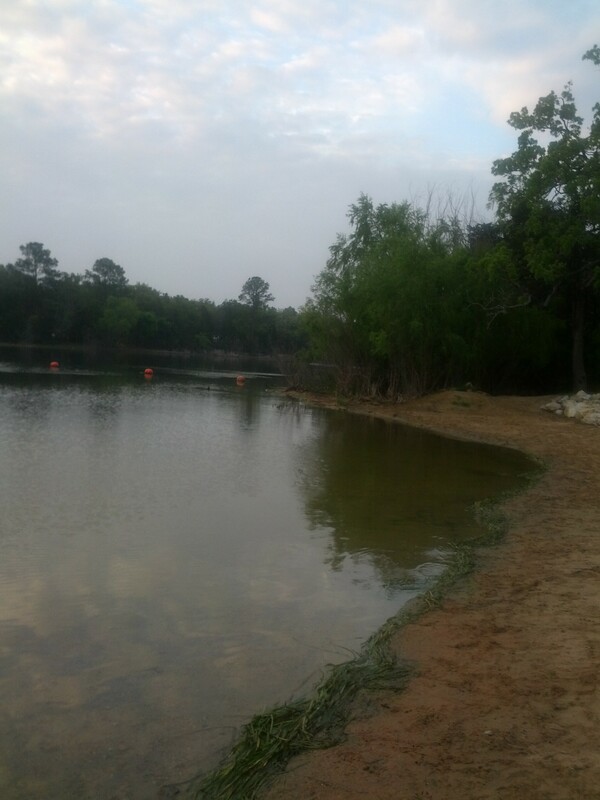 We were here at the park to experience everything about Bastrop that we had missed out on last month when we were in town for the Texas Challenge. Both the state parks were booked up a month ago when I called to reserve a spot, but this park, operated by the Lower Colorado River Authority, had one cabin left. The cabins offer air conditioned comfort and the chance to go camping without the hassle of setting up a tent. They run about $50 a night, with daily entrance fees on top of that ($5 per adult), but for $130 for the weekend for our family of four, it was an affordable way to enjoy Bastrop without giving up too much creature comfort (not that we normally mind, but we do get tired of packing the tent equipment around). 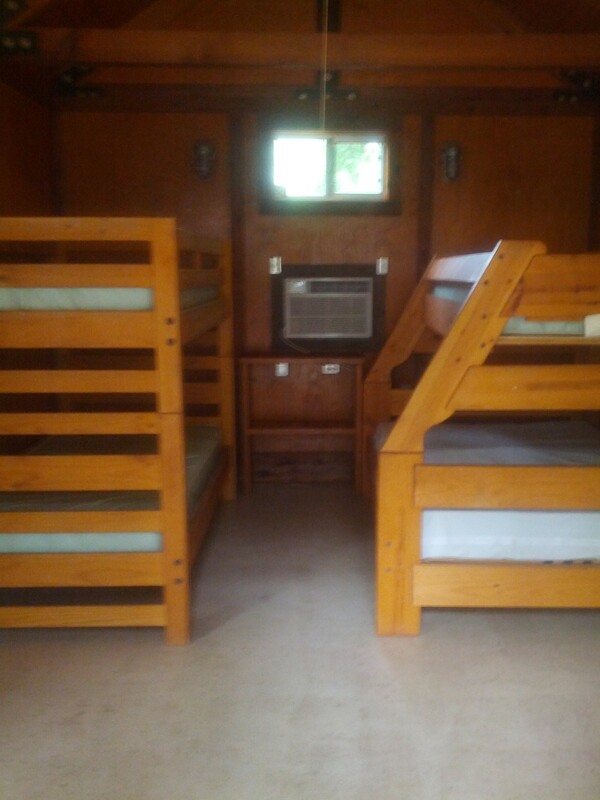 Each cabin can sleep five, with bunk beds pictured here. No dogs are allowed in the cabins (Scout and Breeze had to hunker down with their dog-grandparents for the weekend), and the only drawback to the campsites were that there were no individual fire rings. We did find a fire ring near the cove, though, that allowed us to have a campfire on Saturday night. Later, we left the park to try some of the other things the town had to offer. It was Easter weekend, and I had a little guy who had specifically requested an easter egg hunt ALL THREE DAYS of the weekend. J had shaken his head at my caving to this request the day before, buying Easter eggs and goodies to hide around the cabin for a night time flashlight hunt. This afternoon, we were on the way to an egg hunt at a Methodist church in town. It ended up being my little one and I at the church, while J took the older one with him to WalMart for a supply run (there was a bike situation). While we were at the church, the kids went inside to listen to the story of Easter. I watched my son get really excited as the teacher brought out elements of the story, and he came to sit next to her to show off how much he knew about the story of Jesus. I realized how much he was learning about his faith from the stories I told him, or the things he read in his little Bible that my old church sent him when he was born, or picking up from Sunday School. The egg hunt ended before J was back to pick us up, so we walked down Main Street and ended up checking out a couple of stores. I bought us ice cream cones at the the old time soda fountain in the Lock Drug Store. Next door, we found a collection of geodes and interesting rocks displayed in baskets and boxes in front of the Bastrop Goldsmith Silversmith. We love interesting rocks, and we bought a few for our collections. I was talking to the man who ran the store about how I wanted to add the one I bought to a terrarium (like the ones I made for my wedding), and he was excited about this idea and told me where I could harvest little plants nearby. While I was talking to him, I noticed some interesting gems in his display, and asked about them. They looked like bright sapphires. He told me they were gems made out of the ashes of Mt Helens (Helenite). As he pulled the rings out to show me, I saw J driving by, and had to rush out to meet him to get picked up. I was so excited about the jewelry and let him know it was something I would love for an anniversary or something. That man of mine is so awesome that he actually contemplated stopping into the store to buy something for me later than night when he had to go back into town, but realized I was so on top of the budget that he would have a hard time hiding an expenditure like that right now (I am trying to save for our vacation this summer). After this, we stopped for lunch at the place I was craving the whole time we were in Bastrop last time – the Roadhouse Cafe. We sat on the porch and nibbled on friend pickle spears and chili cheese fries. J tortured me with letting me have a bite of his mouth watering cheeseburger, but I was really enthralled by the Fiesta Chicken Salad I had ordered. Despite the kids each spilling a soda on their laps, we had a really nice time there. After this, we went for a bike ride at the Colorado River Refuge, but that was such a cool place that I will have to write about it later. Then we returned to the park, and all promptly fell asleep in our beds in the cabin for a nice afternoon nap. I was woken up by “Mom, mom, mom” a’la Stewie from Family Guy style, by the little one who wanted to be fed again. After a snack, we headed back out to the swimming area. This time, there were other children playing in the water, so it wasn’t long before my son was off and playing with them, no longer concerned about what might eat him in the water. I had waded out with him, but now I could just relax a bit. I leaned back and made myself horizontal, laying in the water like a bed. I can hear the children playing a short distance away from me, so I can tell from the sounds of “Marco! Polo!” that my son is safely engaged in his own activities. All I have to do is cross my feet and my arms, and I am floating along with the pull of the water. Eyes closed, I make myself completely at the mercy of the universe. At this moment, I literally have blind trust that everything will be okay. All the worries of the days and weeks and months slide away from me. When I open my eyes, all I see is sky and clouds, and I am focusing only on the water and wind. For some reason, it makes me think about baby Moses, at the mercy of the world in that little basket on the Nile. God saw to it that little baby Moses was found safely by Pharoah’s daughter, unharmed. I feel a bit like that baby right now, knowing that everything will be just as the universe intends it to be. 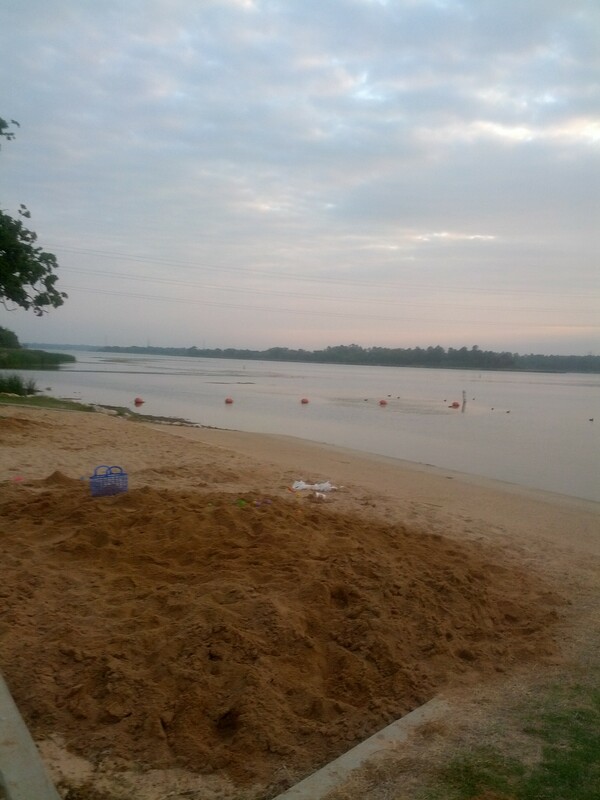 The swimming area had these big piles of sand for the kids to play in, and I had thought ahead and brought a bucket and shovel for the little one. He got out of the water and happily played there with the other kids, while I picked the fishing pole back up, restocked my wine, got my journal and binoculars out, and spent the afternoon away on the fishing pier. After this, we all gathered around the cabin for a delicious baked macaroni meal cooked over our campstove. Then, we carried the firewood over to the ring and made our fire. As we sat there, I asked the kids what is the happiest they remember being. All my happiest memories seem to take place in a campfire’s glow, and my older son said the same thing. Almost all his campfires have been with us, so that makes me happy to know that we are giving that to him. J’s happiest moment is when we all slipped off to bed, leaving him alone with the dying fire. After all we experienced over the weekend, it was the reflection on faith and trust that touched me the most. My sons surprised me with what they knew and learned about faith, and I wonder if they thought the same from me. It was a memory we can hold on to later, and I hope we will have more here. It is definitely a place I would like to go back to.